The purpose of this paper is to present an innovation model to enable implementation of a policy of innovation on a continuous basis. Literature has presented a range of innovation models that reflects its growing importance to countries and organizations, especially business enterprises. An innovation model comprises a group of principles, regulations, routines and practices that guide innovation processes. In specialist literature, the models refer to technological product and process innovations; using the Oslo Manual classifications organizational and marketing innovations are disregarded. Initially a review of innovation models will be presented in line with the different generations created over time. The first use of the expression “innovation generation models” has been lost over time, it is always possible to find precursors. This topic has been dealt with by a number of authors in the innovation area, so much so that today, what is an already vast volume of literature is continuing to grow. Despite this, there is a missing element, or at least one that is barely represented in these models. Incremental innovations, which involve few resources and risks, not received full attention in specialist innovation literature. This paper seeks to retrieve the importance of these innovations and describe a model based on this type of innovation, but without ignoring radical innovations. Before describing this model based on the widely acknowledged adaptation of the funnel, as developed by Clark and Wheelwright (1993), a discussion of incremental innovation and continual improvement will be presented according to the two concepts or branches of understanding. In addition to the basic operational characteristics of the model, the results achieved in recent times will be presented. As will be seen, the model presented is part of the sixth generation of models, according to the literature reviewed. This article was prepared on the basis of primary data collected from the company that created the model and data gathered from a study conducted by the EAESP/FGV Innovation Forum. In this regard, company documents were consulted relating to these practices and the model’s modus operandi. The focus of the Forum is the study of innovative organizations, and is made up of three phases: (1) the study of the timeline to understand the current status, based on an historical perspective of the organization; (2) identification of the manageable elements inside and outside the organization, which can predict its capacity to innovate; and (3) a study of exemplary innovation cases achieved in the organization to understand how these elements arose, which simplify or complicate the accomplishment of innovation processes in a concrete way. The Forum’s studies require the joint participation of academic researchers and professionals from the company studied and directly involved in innovation in an effort to align theoretical studies on innovation and the its practical application. As expected, there is no consensus among scholars in this area as to the number of generations and their names, as shown in Chart 1, because different views on the innovation process result in different explanations of the origins and processes. Despite these differences, we can see that a certain sequence and certain titles recur, which is explained by the Rothwell (1994) article that has become a mandatory reference on the subject. For instance, Tidd (2006) repeats the Rothwell classification (1994) differing only in the last generation. Chart 1. 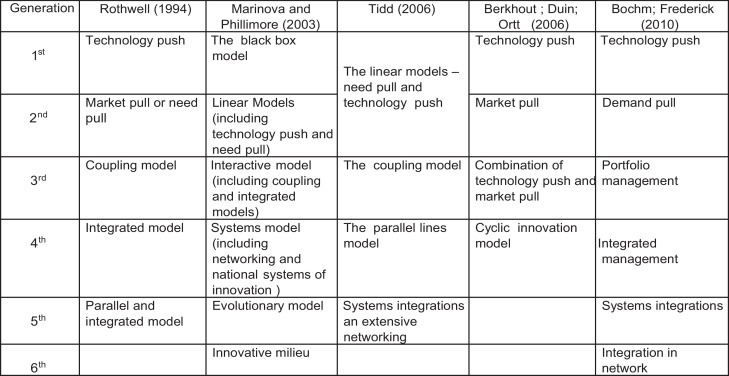 Innovation generation models – selected authors. Rothwell (1994) presents five generations using the US environment as a reference. The linear model, or technology push, is regarded as the first by most authors who study this subject. Its origin is the report from scientist Vannevar Bush, entitled Science: the endless frontier, in which basic scientific research is given as the fundamental source for industrial development, which could stagnate if neglected for a long period (Bush, 1945). This model focuses on intensive innovations based on the scientific knowledge produced in public and private R&D centers or units. This supports the very common belief in the scientific community that scientific progress will be used in practice based on a continual flow from science to technology and this for the markets (Fig. 1). The popularity of this model ended up adding to specialized literature an emphasis on innovation in new products and processes with a high degree of technological novelties. The second generation of models was developed in the mid-1960s and 1970s, a period in which an intensification of competition in the US economy can be seen and investments began to migrate to new products and related technologies. This is diametrically opposed to the first generation, which is why it was called reverse linear, as shown in Fig. 2. The market is the source of ideas that drive R&D operations, thus the expression “market pull” or “demand pull”. The push vs pull debate has excited authors on the topic for decades but several empirical studies showed that the technology push and need-pull models were extreme or atypical cases of a more general model of interaction between technological capabilities on the one hand and market needs on the other. This interaction model would be the third generation, the origin of which can be attributed to Rothwell and Zegveld (1985), who called it the coupling model, or combined model (Fig. 4). According to Rothwell (1994), the third generation began early in the 1970s but as from the mid-1980s began to be regarded as best practice by the majority of large western companies. The third generation in the Bochm and Frederick (2010) design, called portfolio management (Chart 1), is just a different name for the coupled model, since one of its basic distinctions is the convergence of technological capacity and market needs. As in prior model generations, innovation is also conceived as a linear process, the operations sequence of which is similar to the second generation model, although including some interactions and feedback between them, as represented by the two-way arrows. This fact was widely exploited after the Kline (1978) and Kline & Rosenberg (1986) articles, in which a chain linked model is presented and criticized the idea that technological innovations flow directly from research (Kline, 1978, p. 37) (Fig. 3). Even after the rise of other model generations, the concept of reverse linear flow with different variations remained popular among companies and textbook authors from the production, marketing and product development areas. One example is the seven stage business plan model (Fig. 4A), developed by Cooper (1986) and afterward replaced by the model entitled stage gate, today a registered trademark R.G. Cooper & Associates Consultants Inc. (Fig. 4B). To finalize a stage, an assessment is made on the basis of criteria established by the company management to decide whether the innovation process can pass through the gate to begin another stage. The assessments are of the go/no-go type and the project can be abandoned forever, put off for another time or receive reinforcements to be carried forward. Therefore, ideas generated in the initial stage may not be approved and innovation projects may be discontinued (Cooper, 2008). The fourth generation ranges from the early 1980s to the beginning of the 1990s, a period in which US manufacturing companies underwent stiff competition from the Japanese on the global market (Rothwell, 1994). This generation presents the two most outstanding characteristics of the leading Japanese companies in terms of innovation: integration and parallelism. According to Bochm and Frederick (2010), the fourth innovation generation was driven by Simultaneous Engineering or New Product Simultaneous Engineering and the skill with which Japanese companies were using these processes to generate disruptive innovations, for example, automobile manufacturers’ ability to introduce new cars within 30 months, while their rivals took from 48 to 60 months. The fifth generation innovation models, which were being incubated at the time when Rothwell wrote his article, are bases for the intensive and flexible use of integrated networks and systems for implementing innovations quickly and continually. According to Rothwell, the fifth generation is essentially the fourth generation (parallel and integrated) in which the technology of technological change is itself changing (Rothwell, 1994, p. 15). Of the designs defined in Chart 1, the important contradictory positions are those of Marinova and Phillimore (2003) and Berkhout, Duin, and Ortt (1999). These latter authors take into account that the fourth generation cyclical model would be, according to them, the most appropriate for an economy characterized by interaction and change. Marinova and Phillimore (2003) believe that the first generations are the black box model, an allusion to the book by Nathan Rosenberg “Inside the black box,” which was published in 1982. According to this author, economists dealt with technology for a long time as events which took place in a black box and dedicated efforts to trace and measure their consequences as per the self-imposed rule never to question anything that happens in this black box. This book strives to show what is inside this black box (Rosenberg, 2006, p. 7). Borrowing from cybernetics, the expression ‘black box’ refers to any apparatus, the inside of which is unknown, and in this model innovation processes are not important, but the resources used and the results achieved are (Marinova & Phillimore, 2003, p. 45). The fifth generation is an evolutionary model inspired in the concept of Darwin’s evolution by natural selection. In this model, innovation is the same as a mutation in the field of biology, a way of producing varieties of species. The generation of varieties in the economic field results of the innovation process promoted by competition in free market economies (Marinova & Phillimore, 2003, p. 49). The sixth generation, according to Marinova and Phillimore (2003), requires interaction networks and innovations systems, which is in conformity with Bochm and Frederick (2010), but goes further by inserting the innovative milieu, such as the model’s central element. The innovative milieu is a creative combination of generic knowledge and specific competencies, as well as a territorial organization and an essential component of the technical and economic creative process. Among its important features is the ease of contact and trust between partners and social, cultural and natural conditions, such as the leisure, education, health, climate and quality of life options for the residents (Marinova & Phillimore, 2003, pp. 50–51). A deficiency of the innovative models mentioned concerns the fact that they were conceived for innovation that present a major technological novelty, which the literature calls ‘radical’. Innovations in management methods and business models are not their focus. Radical product and process innovations require greater care on the part of management since they demand specialized resources and the uncertainties in relation to the expected results are greater. Incremental innovations involve few resources and it is easier to predict whether they will be successful or not, because they are stimulated by problems that arise in the organization’s operations and marketing routines. Classification into two opposite types of innovation, radical and incremental, although widely used, does not account for the wide variety of situations, which has led many authors to propose intermediate types. Davila, Epstein, and Shelton (2006) rank them as radical, semi-radical and incremental, according to their degree of novelty from a technological point of view and the business model, as shown in Fig. 5. Gundling (2000) categorizes innovations that create a new industry as extremely radical, those that change the competition base of an existing industry as radical and improvements aligned to the current consumer needs as line extensions. These correspond to incremental innovations, according to other classifications. Although the importance of incremental innovations is not denied by authors in the innovation area, they are not taken into account in general in the innovation model. It is a known fact that innovations that present significant novelty are not complete without countless incremental innovations being achieved to resolve problems that only arise after the regular production phase and commercial introduction. Many problems relating to radical innovations are perceived by internal personnel in the performance of their daily activities, especially in the manufacturing process, and by customers or users of the innovative goods or services, which prompt the aftersales services. The solution to these problems as they are identified sustains the success of radical innovation. Furthermore, as Tidd notes (2006), the accumulation of incremental improvements often creates significant commercial and social benefits. Both types of innovation are necessary and fulfill different company functions; radical innovations are associated with the strategic positioning of the company in relation to the markets in which they are engaged, or expect to engage. Incremental innovations relate to the operational efficiency, the results of which appear as cost reductions, faster order fulfillment, elimination of defect sources, and minor changes in the product to make it more suitable for use, to name a few. Therefore, this type of innovation has been adopted in texts related to quality under the generic denomination of improvement or continuous improvement. The terms improvement and incremental innovation are often used interchangeably, so that continuous improvements would mean continuous incremental innovations. The quality movement generated new management techniques, which are widely accepted today and have become examples of good management and consolidated operations practices. One of them is continual improvement, which is a management practice involving all members of the organization, its customers and suppliers, contractors and service providers in a continual effort to meet the demands for quality, price and variety of products and that deliveries are made quickly and reliably, as required by the current competitive standard; improvements. The word, “continuous” does not mean that they cannot be counted, but that there is a significant change in relation to the conventional way of doing things. Improvements do not wait for authorizations, which imply employee autonomy to achieve them, unless they involve additional resources that are unavailable at the unit where the improvement will be implemented. Since everybody has this prerogative and is encouraged to use it, it is expected that improvements will occur in all areas all the time. In the quality management area, continuous improvement is seen according to two basic branches. One comes from the Japanese techniques identified by the word kaizen, which according to Imai (1988, p. 3) means continuous improvement involving all members of the organization, management and workers at all stages of life, inside and outside the company. One of the oldest records of the institutionalization of this continuous improvement concept is at the Toyota plant, which implemented its internal suggestion system in 1951 (Yasuda, 1991, p. 61). The other branch is the outcome of the natural evolution of Japanese techniques, which were gradually being absorbed by the West beginning in the 1970s, the broad adoption of which had a decisive influence on them being absorbed into the quality management systems of the ISO 9000 series. As a result, continuous improvement is defined as recurrent activity to increase performance, which in turn is defined as the measurable result (ISO/IEC, 2015). The two branches are not incompatible, but differ in conceptual terms and extent; the former takes any type of improvement into consideration, regardless of whether it is measurable or not; all are welcome because it is the correct attitude to put into practice at all times. The second branch focuses on measureable improvements. There is no innovation which does not originate from one or more ideas. This is present in all the innovation models mentioned. There is no other reason that the sources of ideas for innovation are central themes of innovation management in all good books and articles on the subject. That which comes to be a good idea presents different understandings as per that in relation to radical or incremental innovations. Ideas for radical innovations in general are inventions, models, proposals, plans and other ways of explaining an intellectual creation. Koen et al. (2004) understand that an idea is the most embryonic form of a new product, which frequently consists of a new high level vision of a solution to a problem. Already a simple suggestion conveyed orally may be the beginning of an incremental innovation. In general, ideas for incremental innovations arise from the achievement of specific activities and are often implemented without a formal process. Ideas about products, processes and businesses, whether new or modified, come from sources inside and outside the organization. Customers, suppliers, competitors, trade fairs, research institutions, technical publications and patent documents are examples of external sources. Internal sources come from the organization’s own personnel and can be divided into two groups: (1) the directors and employees especially assigned to innovative operations, such as R&D, product development and market research and (2) workers who were not hired for such purposes, such as factory workers, sellers, buyers and administrative staff. The second group has been encouraged by means of suggestion systems, the origins of which are the so-called suggestion boxes that have been around for a long time. There are even records of their use in the XVIII century, but they gained sway with the quality movement (Lloyd, 1999). Once simple expedients used to collect ideas that could come from employees who had no relationship with the organization’s management process, these systems grew to be components of the management process for expanding horizontal and vertical internal communication and increasing the involvement of employees in achieving the company objectives and stimulating their creativity and, as Van Dijk and Van der Ende (2002) put it, making them an essential ingredient in its innovation capacity. Despite the immense variety in which these systems are currently presented, there are two basic types, according to Barbieri, Álvares, and Cajazeira (2010): remunerated suggestion and participative systems. Remunerated systems encourage ideas to be put forward offering a pecuniary reward to those employees who present ideas that benefit the company. One example is the Siemens’ 3i system, in which the originator of the approved idea receives a monetary award of up to a maximum R$ 100,000.00, according to what benefit it is to the company.1 In this type of system, each idea goes through a complex evaluation process, similar to any major innovation, since the costs and benefits to the company need to be calculated to determine whether it is worth implementing and if so, to calculate the amount to be paid to the generator of the idea. These systems are evaluated on the basis of the economic results that revert to the company and not on the number of ideas. Since the effort the company puts into evaluating these ideas is not trivial, it expects them to be both important and new. The generators of these ideas should present them with some degree of detail and a preliminary study on costs and economic results for the company. Therefore, it restricts the generation of ideas to those employees who have a more technical background. The participative systems adopt the kaizen approach, in which ideas are encouraged by symbolic awards; economic reward is associated with the quality of life in the work environment and the permanent economic benefits for all workers by means of job stability, profit sharing, health plan, work hours bank and an opportunity for professional growth. This approach requires an internal environment that is conducive to participation by all employees in the solution of day-to-day company problems, since according to the Kaizen philosophy, the greater people’s participation, the greater the gradual accumulation of small knowledge. Therefore, a participative management style that values the knowledge of employees in any area, function or hierarchical level is necessary and ensures continued collective economic benefits, especially during periods of crisis. This appreciation can run to a meeting of the minds on the JIT philosophy of the zero waste concept. Disregarding the capacity employees have for proposing and achieving improvements is just as much a waste as duplication of work, time lost because of a shortage of materials or programmed maintenance and the pollution generated by the production process, to name a few (Barbieri et al., 2010). Since the important factor is the participation of all to achieve permanent improvement, the degree of an idea’s novelty is irrelevant, as is the benefit that it can bring the company. However, the number of ideas generated is important, since it reflects the degree of dedication on the part of the personnel to the management model. Nevertheless, a large number of ideas is expected daily, which requires specific administrative support to be able to provide fast and suitable responses to those who came forward with the ideas, so as not to frustrate their expectations. Approval of the ideas and their implementation must be fast to avoid discouragement and frustration. The number of ideas implemented is important because it shows the involvement of the supervisors and autonomy they have to put the ideas of their subordinates into practice (Barbieri et al., 2010). The achievement of improvements by the thousands is the best approach to the continued improvement concept. This model was developed by Brasilata S/A, a manufacturer of metal packaging containers and a 100% Brazilian capital company, with around 1000 employees throughout its four units located in the states of São Paulo, Rio Grande do Sul, Goiás and Pernambuco. The sector in which the company is engaged is highly competitive, with nearly 40 companies of varying sizes, from very small to large scale operations, operating in the same sector. One of the characteristics of companies in this sector is specialization by container type. Brasilata specializes in aerosols, cans and pails of up to 20 l. A significant part of its production is complex steel packaging containers, which have more than three parts (lid, ring, body and base) and are used for canned products that are consumed progressively, meaning the cans must be opened and closed a number of times. The company belongs to a sector which was already considered mature in the 1950s and, surprisingly, has been consistently regarded as one of the most innovative in Brazil (Robinson & Schroder, 2014). It is the highest award winning company in Brazil domestically and internationally in its sector for its innovations, the quality of its products and other performance criteria, such as punctuality, speed and flexibility. In 2008 it won the FINEP award, the first time this award was awarded for a management model. These and other reasons account for the fact that the company is continually studied and cited in books, academic periodicals, corporate and government entity newsletters, popular magazines and newspapers. The model originally recreated the implementation of Japanese management and operations techniques in 1985, such as kanban and Just-In-Time. As a result of intensifying these techniques, the company created the Simplified Project in 1987, a suggestion system inspired by Toyota, called the Toyota Creative Idea. The Simplified Project was conceived as a channel by which employees can present their ideas on any issue related to the context of the company and can receive symbolic awards. This change process is a reformulation of the company objectives written in a participative manner and involving directors, managers and supervisors. This reformulation was aimed at forging long term relationships with its stakeholders based on the following general objectives: with regard to the shareholders, to strive for profitability in a sustainable way; concerning the employees, a policy of no dismissals and professional valuing; for the customers, crisis contingency management; and for suppliers, a partnership relationship. At the beginning no one could imagine that an innovation model was being incubated, with a suggestion system as its central component. Most of the ideas generated relate to operations and administrative processes, as is typical in the kaizen branch systems. Even ideas that are not approved are rewarded symbolically and regarded as an investment. Employee acceptance of the Simplified Project, which is measured in terms of the ideas generated and implemented per employee per year, as will be seen, provides a structure for an innovation model that is geared toward incremental innovations (Barbieri & Alvares, 2013). This innovation model is based on the company’s internal innovative milieu, a work environment that leads to members of the company generating large numbers of ideas. The employeeś quality of life is not derived from local or regional conditions, as in the model described by Marinova and Phillimore (2003), but rather from the work environment, appreciation of the employees and collective economic benefits (employment stability, work hour bank, profit sharing, health plan, day care, education assistance and professional education, etc.) Therefore this model can be regarded as the sixth generation, according to the classification of these authors. Since the mid-1990s the EAESP Innovation Forum has adopted a concept from the internal milieu, as adapted from Castell and Hall (1994, p. 314). In their opinion, the innovative milieu is made up of a system of social, institutional, organizational and territorial structures that create continual synergies and their transformation into production processes, as much for the production units that are part of this innovative milieu, as for the milieu as a whole. This synergy arises from a linked group of organizations (production companies, financial agents, education institutions and research, as well as government agencies that encourage research, etc.) in a specific location, such as Silicon Valley, Route 128, Sophie Antipole, Hsinchu, Sendai and others, which the authors call technopolis. Note that this innovator milieu concept is the same as in Marinova and Phillimore (2003). Applying this concept to a company, Barbieri and Álvares (2005) called the internal innovative milieu a work environment that operates effectively and continually to generate innovations to remain competitive in the markets in which it is engaged. According to Vasconcellos (2014), the innovative internal milieu presents the following characteristics: participative management, decisions that are transparent and made taking into account the implications; the people perceive that they are valued; performance is collective and there are no punishments for those who perform below average, learning is encouraged and perceived by the employees, the environment is one of confidence and the people know they can freely express their opinions without fear of retaliation on the part of the directors and supervisors, problems and conflicts are faced openly and understood as part of the solutions. These characteristics make a company a good place to work and sustain the motivation that encourages and favors innovation initiatives of any type, which have a real chance of succeeding and flourishing. In terms of operations, the model is an adaptation of an innovation funnel developed by Clark and Wheelwright (1993), one of the most popular in the business environment. The authors presented three types of funnel. Type I (Fig. 6A) is a common model in large technology intensive companies, in which ideas regarding technologies and new products and processes are mainly generated by the R&D unit. Type II (Fig. 6B) is a model more common to small companies, including technology-intensive ones, in which the company wagers on individual projects one at a time. 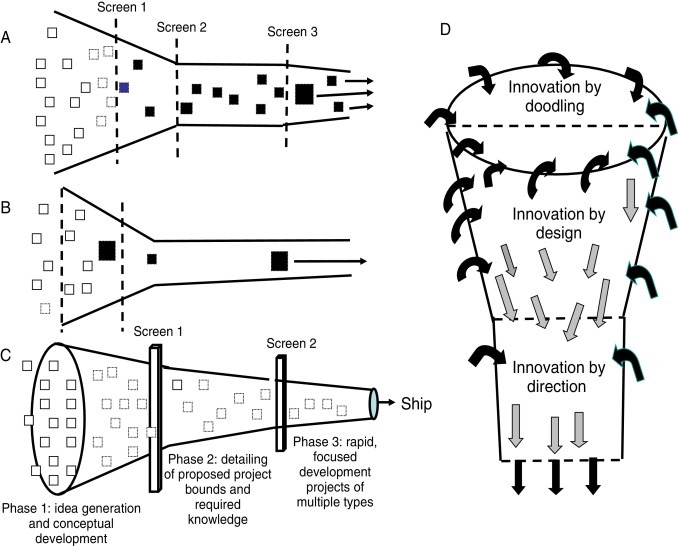 In type III the mouth of the funnel is expanded to encourage the generation of more and better ideas from a number of sources, not just the R&D unit (Fig. 6C). The popularity of this model led to a numerous variations, such as 3M model shown in Fig. 6D. The decision-making about whether a specific innovation project can move or not from one phase to another is the go/no go type mentioned previously. The funnel model contains filters that select only ideas that meet the selection criteria established by the company management, for example, the cost-benefit relationship of the investment in a new project. In this way many ideas generated will not be used to advantage. As it was devised for important innovations and in view of the known phenomena of idea decay, the large mouth of the funnel reflects the entrance of many ideas and the narrow neck, the filtering process by which many ideas will be discarded because they do not meet the selection criteria. This configuration is not suitable for incremental innovations achieved according to the continuous improvement of the kaizen branch; hence the need for adaptation, as shown in Fig. 7. Fig. 7. Incremental innovation model. 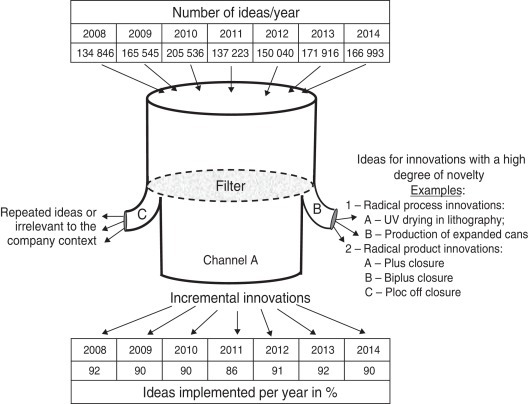 Discarded ideas: repeated ideas, those already implemented, or that are irrelevant to any company situation (channel C). Whatever the decision, the employees who put forward the ideas can follow up on their progress by means of the Simplified Program site. Every idea relating to the organization is used. 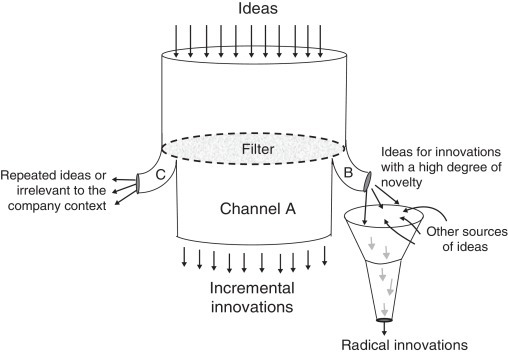 Channel A, the main one, is the spillway of incremental innovations and channel B is for ideas that could generate radical or semi-radical innovations. This channel represents the removal, for closer examination, of those ideas which, since they present a high degree of novelty, technology and/or merchandizing, imply large investments and high risks. These ideas may or may not be used but they will nevertheless go through a typical innovation funnel. If they are used, they will receive specific financial, material and human resources. They will be developed by special teams and go through other filters, the decisions of which are of the go/no-go type. Depending on the decision, the idea could be developed, postponed for another time or discarded permanently. Note that in this funnel ideas enter from other sources, such as customers, suppliers, R&D, patent documents, etc. Even though the focus is on incremental innovations, ideas commonly arise that serve as insights for radical and semi-radical innovations, which are forwarded to the Engineering and R&D areas. The specific R&D area was structured in 2012. Until then the ideas filtered via channel B were handled by ad hoc technical teams that were formed according to the idea specifications. The ideas that pass through channel B go on to a funnel such as that described by Clark and Wheelwright (1993, p. 302), especially model type II, since it is more appropriate for companies that need to concentrate their resources on innovation projects that have a high level of novelty, such as in the case of Brasilata. people face problems openly, conflicts are not avoided and when they exist they are placed in the open to be solved. Conflict control is generally conducted by the group itself; the managers and supervisors do not interfere to solve the conflicts, but work as facilitators (Barbieri & Álvares, 2005, 2013). Fig. 8 presents the number of ideas provided by employees from the years 2008 to 2014 and the ideas implemented in this period that form the main flow of incremental innovations. All of the metrics used to evaluate this type of suggestion system show significant results. The large number of ideas suggested and implemented is the result expected from participative suggestion systems. One of their objectives is to increase internal communication and retain knowledge so that all modifications effected by any employee are recorded. Therefore, the system stimulates the transformation of tacit knowledge into explicit knowledge, thus building a high level knowledge component. Fig. 8. Incremental innovation model – some results. For many, the kaizen branch would only be able to prosper in an environment impregnated by Japanese culture. The Brasilata case shows that this is not correct; kaizen at Brasilata not only worked, but served as an example that is admired, even by Japanese companies. Its success can perhaps be better explained by the constancy with which it has maintained its proposals over time. Since it implemented Japanese management techniques in 1987, Brasilata kept them, even when faced with the many economic crises which have occurred since then, such as in 1995, 1999, 2002, 2009 and 2014, among others. This persistence has enabled it to consolidate employee commitment to the Simplified Project and, therefore, to its internal innovator milieu. The process of printing on steel sheets presupposes the application of inks and varnishes, which are then placed in an oven, which heats up to a temperature as high as 200 °C. To prevent the emission of pollutants into the air, the gases pass through a burner where they are incinerated at 700 °C, which entails high fuel consumption (LPG or natural gas), in addition to generating an environmental liability due to heating the atmosphere and the additional expenses of treating toxic gases so that they will not be released into the work environment. In the last few decades paints have been developed that enable drying by ultraviolet radiation (UV). However, these inks are not compatible with all types of cans. In the mid-2000s, a Brasilata technician suggested studying the possibility of lithographing some chemical product cans with UV paints. This simple idea gave rise to a process, which over five years significantly changed the company’s lithograph center. In 2014, eight of the ten existing print lines used UV paints. This is one radical process innovation which can be categorized under the eco-innovation concept, or environmental innovation, i.e., an innovation that presents positive results for the company and the environment, in the case in question, a reduction in polluting emissions and the use of materials. One of the technicians from the R&D area of the São Paulo unit, when analyzing an expanded food can produced by the company Rojek (another Brazilian can maker), came up with the idea of using the same process to produce rounded paint cans. The matter was studied, but there was an obstacle; the technology was Rojek property. However, since this company does not manufacture paint cans, Brasilata requested and won the ability to license this technology. The transposition of this technology to paint cans meant a complete revision of the licensed process. This was also an eco-innovation, because along with the expansion there was also an important reduction in the consumption of raw materials. The closing cans packaging based on friction multiple pressures, introduced early last century, it has become the world standard at the end of the validity of its patents (Fig. 9A). Many attempts were made to improve on it by companies in many countries, but all failed. The plus closure is based on a mechanical lock (Fig. 9B), that is to say, that it is not an improvement on the friction closure, but rather a radical innovation according to the understanding of Gundling (2000), since it changed the industry’s competitive base for steel can packaging. This closure is expected to become the world standard for paint cans once its patents expire, just as happened with friction closure. Fig. 9. Friction closure and mechanical closure. Source: US patent pages: A – patent No. 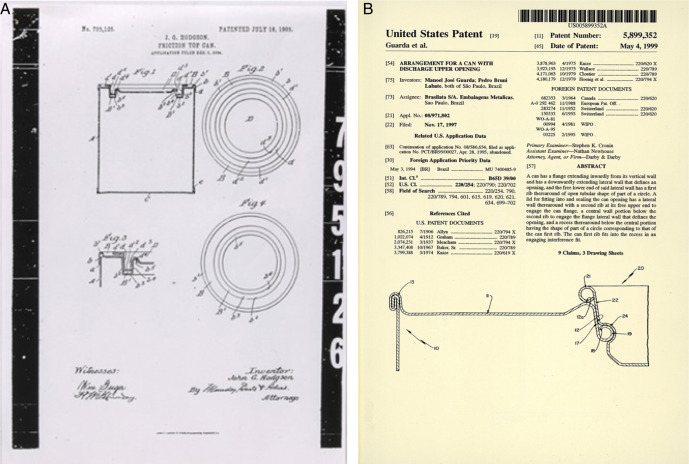 795.126, 1905 granted to John Hudson friction closure; B – patent No. 5.899.352, 1999 granted to Brasilata for its plus closure. In 2013, this innovation achieved the mark of one billion cans sold. This success is owed to these advantages: (1) it is nearly three times more resistant than friction closure in relation to internal pressure, impact, blows and falls, as shown by tests conducted at renowned research institutions that specialize in packaging technology; (2) it is easier to open and close, while at the same time it hinders violation of the contents; (3) it results in a saving in materials, ranging from 19% to 25% when compared to the conventional closure system, an advantage associated with sustainable development objectives, since it considerably reduces the use of natural resources. The marketing area personnel came up with an idea for simplifying opening and closing paint cans that are color mixed at points of sale, a wish gleaned from paint store clerks. The technical team then developed a second lid, made of a plastic material that, once the seal is broken, allows for easy opening. This second opening is small, but just large enough to allow the pigments to flow from the mixing machine into the can containing the white base paint. In addition to reducing handling time by half, the plastic lid, since it is made of transparent material, enables the customer to check the color without requiring the can be reopened. This resulted in a number of benefits for tradespeople, as well as paint users, among which are a significant reduction in the time needed for filling and closing the cans and for the customer to check the color. According to the Gundling (2000) typology, the Biplus is a line extension type innovation because it introduces changes to a known product to meet a particular user’s needs. According to the Davila et al. (2006) classification, it is a semi-radical innovation that combines a new technology to meet the needs of the same client/consumer group. The ploc off closure is an adaptation of the Biplus plastic lid for powdered food products (milk, coffee, chocolate, etc.) and was inspired by an idea coming from the Simplified Project. An employee in the administrative area, when examining a Biplus closure can suggested adopting this solution for the closure of powdered milk cans. The idea was forwarded to the technical team, which conducted a study of over two years in order to adapt the closure that had been originally created for paint cans for use with foodstuff cans. The adaptation resulted in a simpler closure, easier opening and closing, while at the same time better preserving the food contents after the first opening, which is nearly 30 times greater than conventional closures, reflecting significant economic gains for the consumer and the environment. In this case, the innovation is also of the semi-radical type, which combines technology similar to that of the Biplus to serve new clients. These innovation examples with a high degree of novelty came from ideas encouraged by the participative suggestions system, a central component of the internal innovative milieu of the company. There are few companies in the metal packaging container sector that have such a high rate of patents as this company and in 2013, it accounted for 103 patents granted in a number of countries, including the United States, which is known as one of the strictest countries in terms of technical analysis for granting patents. Since it is a free generation of ideas, they reflect the questions, fears and expectations of people, since citizens are concerned with the problems of their cities, countries and families. Therefore, many ideas are related to environmental issues, such as a reduction in water and energy consumption, waste, greenhouse effect gas emissions, noise, vibrations, etc. The products and processes described are examples of innovation that incorporate concerns regarding these issues and, therefore, can be classified as an environmental innovation concept as well. The model presented attempts to fill the existing gap in the literature related to innovation models, giving space to incremental innovations. The quality movement lent these innovations unprecedented importance, because it was understood that they are the basis of a process for effectively meeting the needs and requirements of the clients. When devising an innovation model focused on incremental innovations, it is expected to highlight the importance of these innovations and establish a bridge between the study of innovation and quality. Most of these ideas refer to the small improvements in processes which the workers themselves implement, but which on the whole bring about enormous advantages in terms of operational efficiency. Some of these ideas are insights for radical innovations that continue on the typical funnel path, which are those that will result in a sustainable competitive edge over time. In other words the model described is also appropriate for radical innovations. Therefore radical and semi-radical innovations are also included in the above mode. A large number of incremental innovations, punctuated by radical episodic innovations, characterize a continuous innovation situation. The innovation model described is based on the internal innovative environment, which can be described as a work environment conducive to making ideas of all kinds flourish. Therefore, there is reason enough to consider it a 6th generation model. As mentioned previously, the original concept of the models of this generation applies to regions, locations and cities in naturally favorable regions, sites and cities that attract professionals, high-tech company, higher education and research institutions. In the example described, the innovative environment of the company resulting from favorable working conditions and the climate of trust provided by a participatory management. Tidd, J. (2006). A review of innovation models. Imperial College London, discussion paper 1.